The Loadmaster 9000i is a highly accurate on-board weighing system for fully dynamic and static weighing. It is approvable for the sale of goods to trade customers and conforms to MID Class Y(b) and OIML standards. Legal for commercial trade applications in all EU countries and many other countries worldwide. Traceable loads to MID Class Y(b) and OIML R51 and R76 (Class IIII) standards. Provides operational and management records of loading activity. Ideal for use on temporary sites or sites without a weighbridge, avoiding the expense of having one installed. Eliminates return trips from the weighbridge of over/underloaded lorries by ensuring lorries are correctly loaded first time. Weighing ‘on the lift’ speeds operation, enabling operators to load more lorries per shift. Batch weighing capability for the uploading of product blends for accurate mixes. Lift speed, temperature and slope compensated dynamic weighing mode. Last bucket tip-off facility for the exact loading of trucks. 1000 store internal database for products and customers. Net weighing option for container/pallet weighing. Angle sensor for slopes of up to 10 degrees included as standard. Integral SD card reader for load data transfer to and from PC. 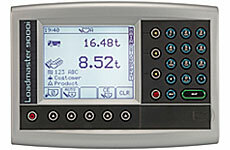 Large easy-to-read, backlit display in a rugged construction for heavy-duty applications. Compatible with RDS printer and data tansfer options.